Chubby Hubby - Duck Season? Rabbit Season? No, Mango Season! Every April, a close friend of ours goes a little nuts. She’s usually a great gal. Beautiful, funny, sweet, generous, and, of course, as you might expect as a criterion of our friendship, wonderfully gluttonous. But April marks the beginning of the all too brief Alfonso mango season. And this gal, L, is mad about mangos, especially the Alfonso (also spelled “Alphonso”). The Alfonso is easily the most expensive mango varietal out there, as well as universally considered to be the best. It hails from India, from states like Goa and Tamil Nadu. Goa, it should be noted, once produced some 77 varieties of mango. Other top Goan varieties include the Musarad and the Mancurado. The Alfonso, though, thanks especially to international demand, is the world’s most coveted mango. The season lasts for only 6 weeks and in order to ensure a supply of good quality Alfonsos, L has taken to bypassing the fruit markets and sellers—who she contends only sells second rate cast-offs to the public anyway—and goes direct to the source. Using some f&b contacts, she’s managed to establish a relationship with a rather dependable Indian fruit importer (not that I’m implying most Indian fruit importers are undependable). So now, thanks to her “hook-up”, our lovely lass orders her Alfonsos, direct and by the box. Frighteningly, she also consumes them by the box, mainlining them like there’s no tomorrow. As mentioned, she’s a generous gal-pal and she not only allows friends to order through her, she also shares her booty (um… meaning the mangos, of course). Here’s a picture of my wife enjoying one. On a final note, a mango, while high in fibre, is also highly nutritious. It’s high in beta-carotene, and contains all four recognised anti-oxidants (Vitamin A, C, E and Selenium) that prevent heart disease, cancer and diabetes. One mango contains three times the recommended daily intake of beta carotene and vitamin A.
Mustafa’s bring in Alphonso mangoes quite often. They also sell it by the box. 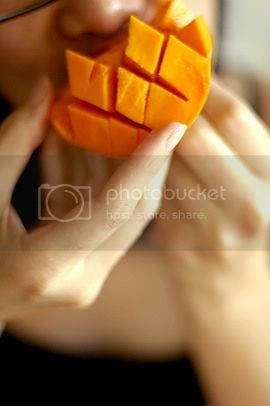 I am not sure what varietal Philippine mangoes are but it’s the best mangoes I have ever tasted! These have to come from the Guimaras region in the Philippines. The ones grown outside of the Philippines, although marketed as ‘Philippine Mango’ don’t quite compare. All I want is one contact that L has for the Mangoes….it’s been 8 years since I moved here and would kill to lay my hands on a good alphonso. Would really appreciate it. Anonymous, no offense, while I’m sure the mangoes you’re talking about are good. To compare them to Alphonses are like me saying the best Adobo is in an Indian province. Bought Benishan (or Banganappalli in Tamil) from NTUC. A bite later I was hooked! Growing up in Indonesia I had thought Indonesian’s Harum Manis was the best mango ever.. but now that I have tasted Indian’s Benishan, my tastebud is like a blind man gaining his sight. Ohh how sweet and the flavor was just soo ummmph.. After reading the post above, I went to Mustafa to try Alphonso. Unfortunately it wasn’t any sweeter than NTUC’s Benishan. Actually I found worms in one.. maybe Mustafa brings in lower grade Alphonso? Can anyone suggest where can I find top grade Alphonso in Singapore? And about that Phillipines’ Guimaras mango, apparently it is listed by Guiness World of Record as the sweetest mango varietal.. that’s one mango I would love to try.. any Pinoy friend can suggest where to find Guimaras mango here in Singapore? The Benishan easily trumps the Alphonso on flavour, sweetness, texture and juiciness. 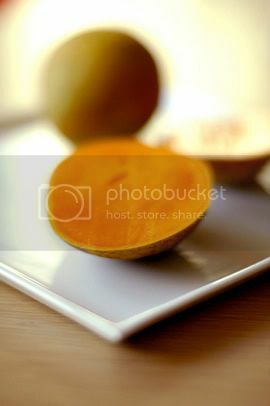 However, the Alphonso keeps better without refrigeration, so it is commercially more important. Neither the Benishan nor the Alphonso should have worms or bugs in them (they’re naturally resistant), so if you found a worm in an Alphonso, it’s probably fake.